This thick and cheesy chowder with potatoes, corn, cauliflower, and bacon is perfect for cold and cozy winter nights. Stove top and Instant Pot directions provided. 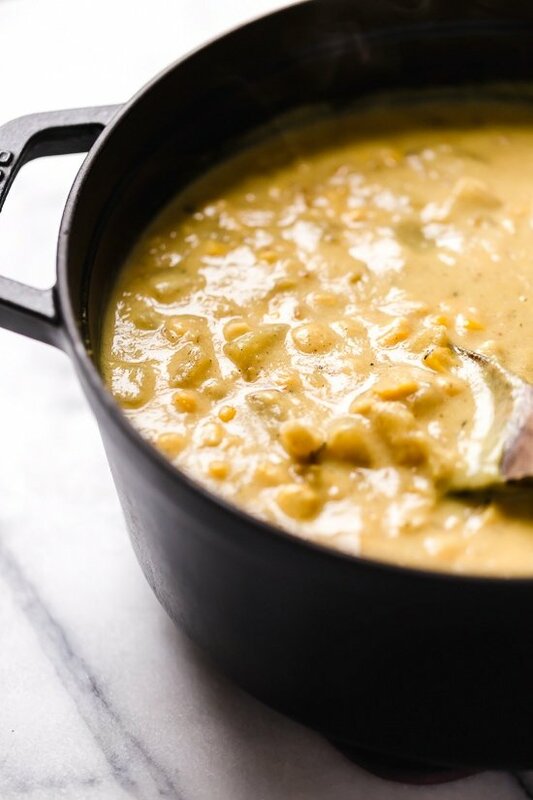 It’s soup season, if you’re looking for a new easy soup recipe to add to your dinner rotation, I think you will love this chowder! 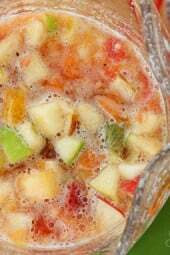 You can also browse all my soup recipes from the archives. A few favorites are the Potato Leek Soup, Dad’s Cauliflower Soup and of course, Classic Chicken Noodle Soup! 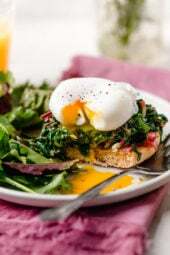 This guest post from Skinnytaste dietitian Heather K. Jones is a tasty recipe that the whole family will devour! Hello, I’m excited to guest post here on Skinnytaste again (thanks, Gina! ), and I’m also excited to invite you to my FREE 31-day Master the Weight Loss Mindset Challenge. You’ll find out how to shift from self-sabotage and worry to inspired and good-for-you action, and you’ll set yourself up for long-term success in 2019! When you sign up for the Mindset Challenge, you’ll also receive a FREE meal prep guide with an entire month of meal plans (with Skinnytaste recipes, of course!). Click RIGHT HERE to transform your mindset about dieting and achieve weight loss freedom in the new year. When Ina Garten’s The Barefoot Contessa Cookbook was released many years ago, I was obsessed. 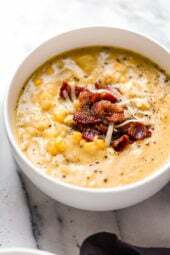 The Cheddar Corn Chowder was one my favorite recipes, but with ½ stick of butter, ½ pound of cheddar cheese and bacon, and 2 cups of half and half, it was far from healthy and light (ha). But after trying Gina’s delicious Cheeseburger Soup, thickened with blended cauliflower, I decided to try and lighten up Ina’s chowder the same way, and holy cow… this MUCH lighter version tastes just as good as the original! It’s considerably lower in calories and fat, but trust me, you’ll never notice. Enjoy! 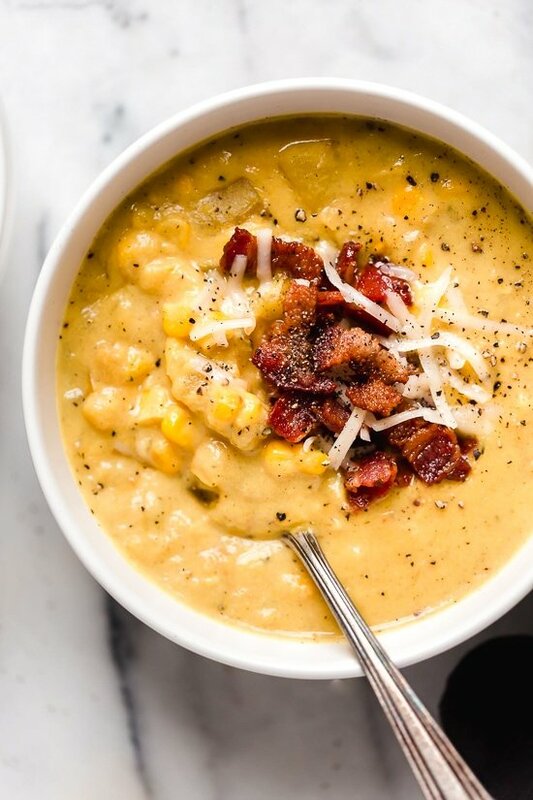 This thick and cheesy chowder with potatoes, corn, cauliflower, and bacon is perfect for cold and cozy winter nights. 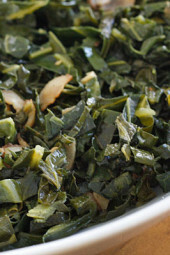 Place bacon in a large Dutch oven or heavy pot and sauté over medium heat, until cooked and crispy. Remove bacon with a slotted spoon and place on a paper towel lined plate. Set aside. With the pot still over medium heat, add the onions and garlic and sauté until the onions are soft and translucent, about 5 minutes. Sprinkle the flour over the onions, add turmeric, thyme, salt and pepper, to taste, and cook for an additional minute, stirring constantly. 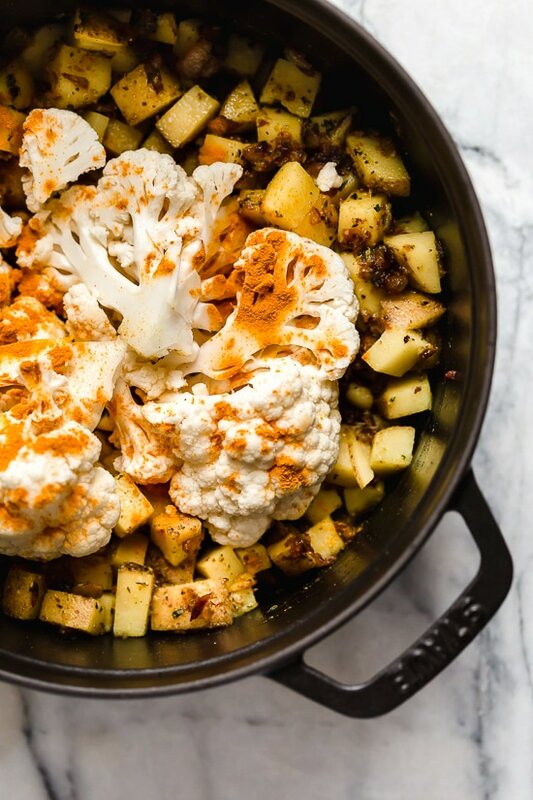 Add the broth, potatoes and cauliflower and stir with a wooden spoon, scraping the bottom of the pot (this releases the caramelized bits on the bottom). Bring the pot to a boil then decrease to simmer, cover and cook 20 minutes. Meanwhile, heat 4 ounces (about 2/3 cup) of the corn with a splash of water in a small microwave safe-dish until just defrosted, about 1 minute. 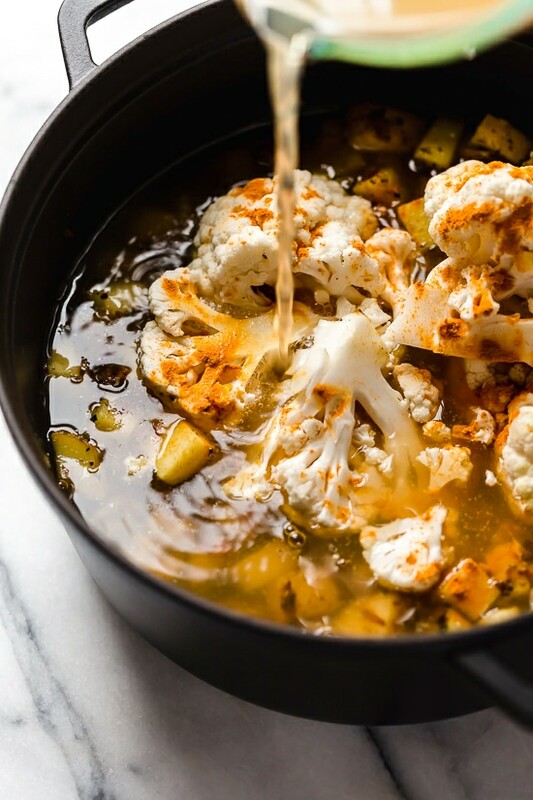 Remove the lid from pot and transfer the cauliflower, 1 cup of the soup and warmed corn to a blender and blend until smooth. Transfer puree back to the pot. Add the remainder of the frozen corn, the milk and cheese. Mix then simmer for 3 minutes or until the cheese is melted and soup is heated through. Taste and adjust salt, if necessary. Serve topped with reserved bacon pieces. Press the sauté button on an electric pressure cooker. Add the bacon and sauté until cooked and crispy. Remove bacon with a slotted spoon and place on a paper towel lined plate. Set aside. In the pressure cooker (still on sauté), add the onions and garlic and sauté until the onions are soft and translucent, about 5 minutes. Sprinkle the flour over the onions, add turmeric, thyme, salt and pepper, to taste, and cook for an additional minute, stirring constantly. Add the broth, potatoes and cauliflower and stir with a wooden spoon, scraping the bottom of the pot (this releases the caramelized bits on the bottom). Seal and cook on high pressure for 10 minutes. Quick release, then open when the pressure subsides. Meanwhile, heat the corn with 2 tablespoons of water in microwave safe-dish until just heated through, about 3 minutes. Transfer the cauliflower, 1 cup of the soup and 2/3 cup warmed corn to a blender and blend until smooth. Transfer puree back to the pot and stir well. Add the remainder of corn, milk and cheese. Mix then cover for 3 minutes or until the cheese is melted and soup is heated through. Taste and adjust salt, if necessary. Serve topped with reserved bacon pieces. I followed the recipe exactly and it was absolutely perfect! The recipe says, “Salt to taste,” so if it came out bland, that’s on you, my dude. This was amazing! It was very filling, and I still can’t believe it’s not bad for me. It was THAT good. It reheated well all week for lunch. I added hot sauce and cayenne pepper because I like the spice. So yummy! I love sneakily adding in veggies to innocent looking dishes haha. Perfect way to get my husband to eat more! 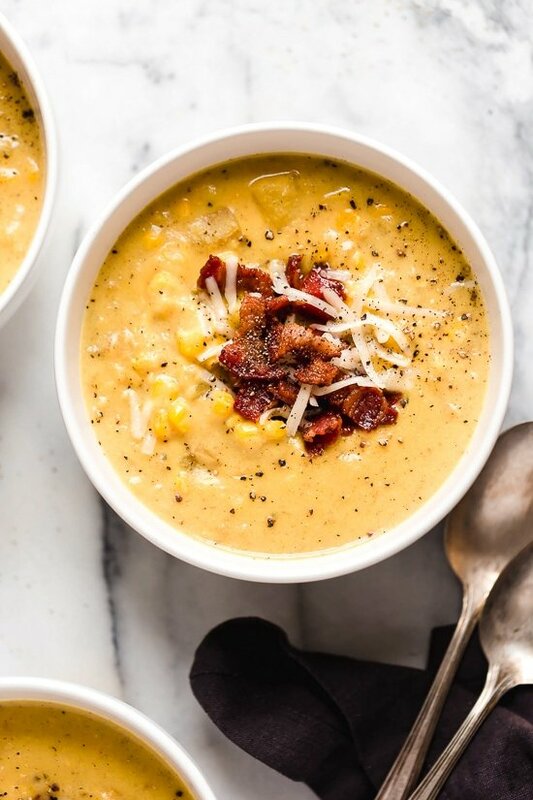 Bacon is the perfect topping for this soup. Has anyone tried it with Almond milk instead? I did it with coconut milk and it was awesome so I assume almond milk would be good too!! This soup was absolutely delicious. I was wondering about almond milk, but was afraid to use it. Next time I will!!! Thank you, Gina!!! THANK YOU, GINA!! This is the kind of soup I have avoided for a long time! I love creamy soups, but they are usually not the healthiest option, so I’ve trained myself to always pick the broth-based soups, both for recipes and also when I order out. It was wonderful to not feel guilty about eating this very creamy soup. This recipe is definitely a keeper!! This was so good! I used to be in the “cauliflower isn’t blah blah lab camp” but this is the second traditionally potato based soup I have made with cauliflower and it is delicious! I will definitely make this one again… but with more bacon! I love your recipes Gina! They help me stay on track to eat healthy and my family is always more likely to eat it without complaining about it being healthy! Oh my gosh so good! Followed the recipe exactly! I made this tonight and it was delicious. Only thing I changed was using 2% milk because that is what I had on hand. Perfect for a cold night. It will great for the coming snow tomorrow too! It is very filling. My friend, who is rather picky, even commented, twice, how good it was. I may try adding extra potatoes next time. It is amazing, I did add extra corn and a can of cream corn the second time I made it, and we liked it’s creamy flavor alittle more. Can this be made without cheese? Can this be made without cheese? Would I have to add anything else? Sure, you can just leave it out. Made this tonight and am a newbie to WW. If we use turkey bacon, fat free milk and 2% cheese im assuming the points will decrease. Any idea what the new value or what the servings per recipe are so I can calculate on my own? Making this now – what should I serve with it? I made it with grilled cheese sandwiches. I personally only had the soup. It is good on its own and the 1 2/3 cups serving is more than enough. Oh my goodness, this soup was delicious! I will make this again, so yummy! I just made this tonight and it was a hit!! It will now be included a go-to recipe. Another hit. So delicious and hearty. I made this on the stove, but after I realized that there were directions for making in the IP. Oh, well next time. I cannot believe it’s made with cauliflower. Yum! Thanks for all the fantastic, healthy, tasty and most of all easy recipes. This is a really great soup. 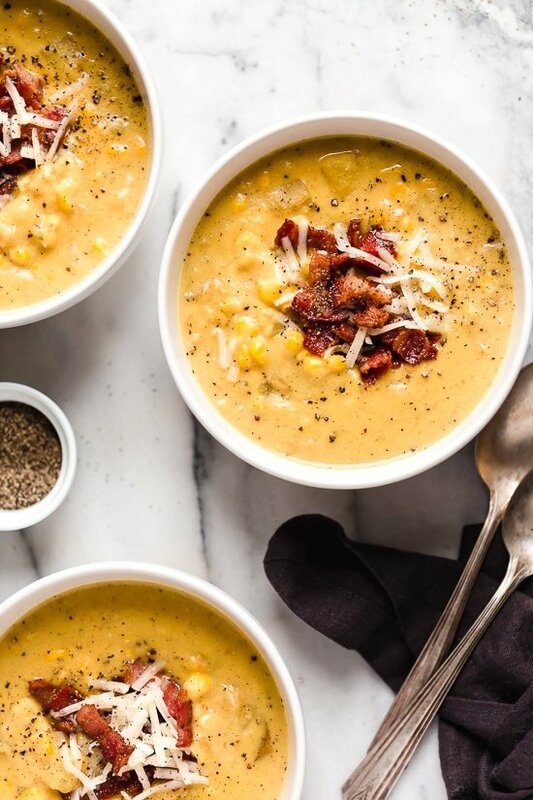 Most creamy soups don’t taste good in the lighter, healthy version, but this one is hearty and delicious. I like a little heat in mine so I added hot sauce and red pepper flakes. YUM! I don’t eat bacon, can I make this vegetarian? Veg-friendly bacon by Morningstar tastes very good. You might need to sub in some oil or butter for sauteing. Can you leave the bacon out of it? I have everything to make it but the bacon. And I want to make it now! Also, what about 1 % milk? I just used 1% milk and it tastes great. I’m not sure about the bacon though! My husband (hates cauliflower) loved it! You can’t detect the cauliflower at all and it’s super creamy. Thank you! I’ve made this twice already and both time my family has loved it! Delicious and the perfect amount of everything. Love the bacon bits on top- so yummy. This. Was. SO. GOOD!!! I am a teacher and my daughter and I had the day off due to a snow day. This hit the spot! It was hearty, creamy, rich, delicious, and SO cozy on this snowy day. Yet another hit! Thank you and keep them coming! Hi! I just have a quick question is the serving size a 2/3 cup? or 1 and 2/3 cups? Thank you! This was excellent and will make this often. My college aged son did not even detect cauliflower ! Hi Gina, this sounds so delish! I was wondering about the points value though. I tried it with the ww recipe builder and with the nutritional values you listed in the recipe and I get 9 points each time. Wondering if I’m missing something? Thanks for all the yummy recipes! Definitely a keeper!!!! I think I may add some broccoli next time to give it a little more substance. Flavor was great! We are not big fans of Thyme in our house. Any suggestions on what can be subbed in its place? Thanks! You can leave it out if you’d like. Not a fan of Thyme…what could be subbed in it’s place? I accidentally left it out tonight (despite buying some fresh thyme) and it still tasted great! This was so incredibly good, hearty and easy to make. I used a bag of frozen cauliflower – steamed it in the microwave and added some corn and a cup of the soup to it for the purée. Otherwise I followed the directions. We’ll be having this again for sure.